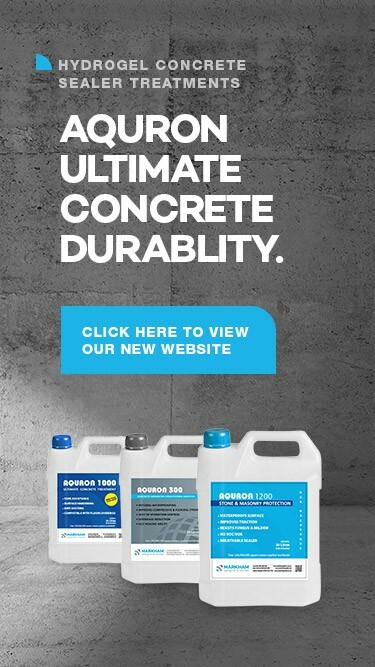 AQURON 2000 waterproofing for concrete has the unique ability to penetrate to depths of more than 150mm. AQURON 2000 concrete waterproofing sealer reacts with alkaline components to form an extensive calcium silicate hydrogel throughout the matrix. This CSH gel is insoluble, permanent and its sealing action is far superior to that of silicone based products which merely line the porosities with water repellent silicones. AQURON 2000 concrete waterproofing sealer adds significant durability enhancement and longevity to existing concrete by purging contaminants and sealing the matrix internally to prevent further ingress and migration of debilitating liquids and vapour. Concrete showing signs of internal corrosion due to high chloride content can be rejuvenated by applying AQURON 7000 to expel the chlorides and then treating with AQURON 2000 to protect against subsequent ingress. AQURON 2000 concrete waterproofing sealer successfully stops leaks in multi-level car park decks, water tanks and below ground basement floors. AQURON 2000 concrete waterproofing sealer has eliminated water seepage from dam and reservoir walls in the face of severe hydrostatic pressure. Many aged concrete structures worldwide which have been affected by corrosion, deep-seated contamination and "sick building syndrome" have been saved from demolition by means of AQURON 2000 treatment.